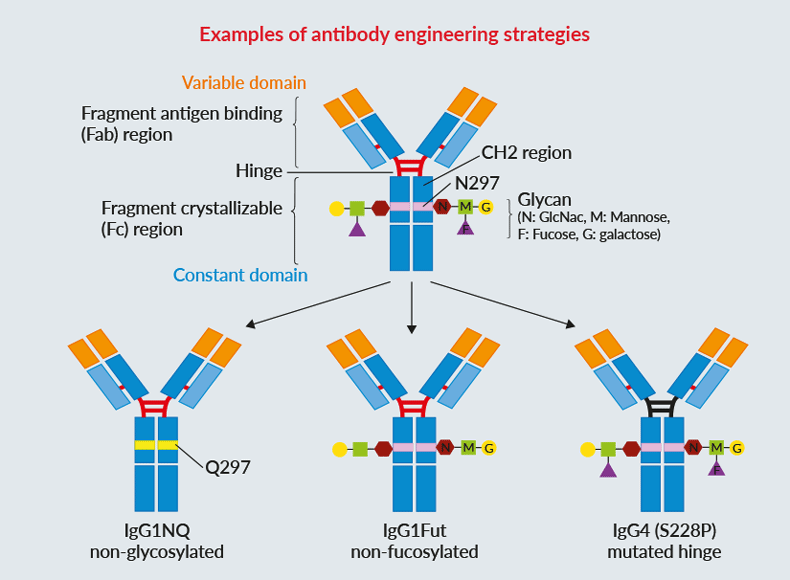 Antibody engineering consists of modifying monoclonal antibody (mAb) sequences and/or structures to either enhance or dampen their functions. Monoclonal Abs have revolutionized the fields of diagnosis and immunotherapy for the treatment of a variety of diseases, particularly in cancer therapy. A challenging issue remains: the production of therapeutic mAbs and Ab-derived drugs with the highest objective response rate in patients and the lowest toxicity [1-3]. Therefore, Ab engineering is a major translational research topic which aims at producing highly specific and effective mAbs, with optimal processing, stability, and tolerance . the “fragment crystallizable” Fc in the constant region mediates effector functions, such as antibody-dependent cellular cytotoxicity (ADCC), antibody-dependent cellular phagocytosis (ADCP), or complement-dependent cytotoxicity (CDC) . assess and compare the functions of your mAbs using our cellular assays and our extensive clinically-relevant mAb collection. Read our product flyer on Clinically-relevant monoclonal antibodies. 1. Saeed A.F.U.H, et al. 2017. Antibody engineering for pursuing a healthier future. Front. Microbiol. 8:495. 2. Wang X. et al. 2018. 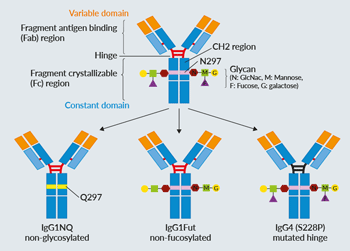 IgG Fc engineering to modulate antibody effector functions. Protein Cell. 9(1):63. 3. Quast I. et al. 2017. Regulation of antibody effector functions through IgG fc N-glycosylation. Cell. Mol. Life. Sci. 74(5):837. 4. Elgundi Z. et al. 2017. The state-of-play and future of antibody therapeutics. Adv. Drug Deliv. Rev. 122:2.